Since Unicode fonts are universal, they can integrate into the operating system. 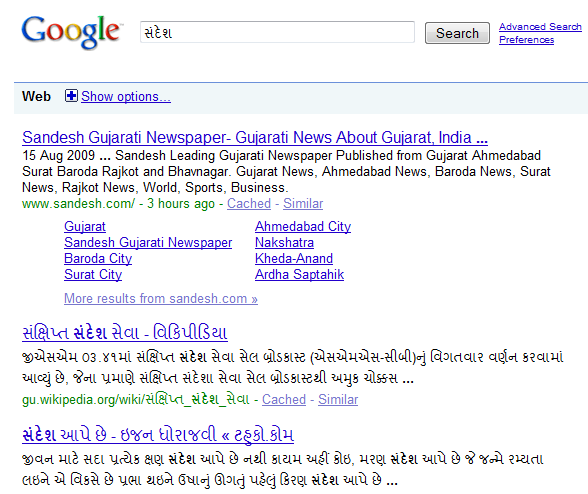 That means you can search for filenames, search the web in Gujarati, in addition to typing documents in Gujarati. This is not possible with non-Unicode fonts. We are not only looking at the ability to type in Gujarati, but also integrating Gujarati into the operating system, such that the OS recognizes the language itself. Just as we name and search files in English, we want to be able create filenames in Gujarati, search for Gujarati filenames, and search for Gujarati text within files. Just as we have spell-checkers and grammar checkers for English, we want the same possibility for Gujarati. Unicode fonts allow this capability. Moreover, the whole interface of Windows (XP, Vista, and 7) can be changed to Gujarati. I don't recommend this as it's awkward to see menus in Gujarati. 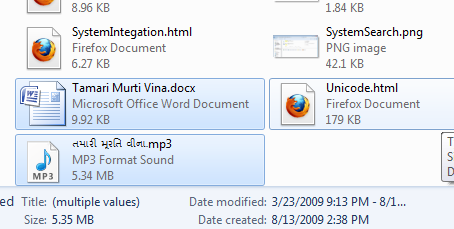 Image 1 shows a file I named in Gujarati, called "તમારી મૂરતિ વીના.mp3". I created another file, a Word 2007 document called "Tamari Murti Vina.docx," in English. It contains the text: તમારી મૂરતિ વીના મારા નાથ રે. The ability to name files in Gujarati is not the only advantage. Remember that the Word document contains one line of text in Gujarati. Windows Vista and 7 have the ability to index files and file content. When searching for the term "તમારી", the following result was displayed on my computer, shown in Image 2. And voilà! Not only did the built-in search find the search term in mp3 file name, but it also found the English-named Word document with the Gujarati text. Technically, we can also search for text in non-Unicode fonts. However, it's more complicated and not without false results. 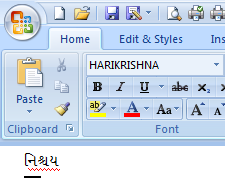 I created a Word document with the text "Nischay" typed in Harikrishna font. Only in appearance does it look like "Nischay"; the text is actually "(náy". Hence, I searched for "(náy". I got the following result in Image 4. One has to search with the English characters, which can are meaningless and error-prone. Search treats characters like "á" as "a". Thus, in the second search result shown, we see a false result of "Nay". Search may ignore certain punctuations. In my example, search ignored "(" from the query. As a matter of fact, one needs to search for ""(náy"" when searching for "(náy". You'll probably get a lot of extraneous matches. In Image 4, most of the results (image edited to exclude them) had nothing to do with my query. The second result was actually not the second hit. After using double quotes, I got a narrower result. 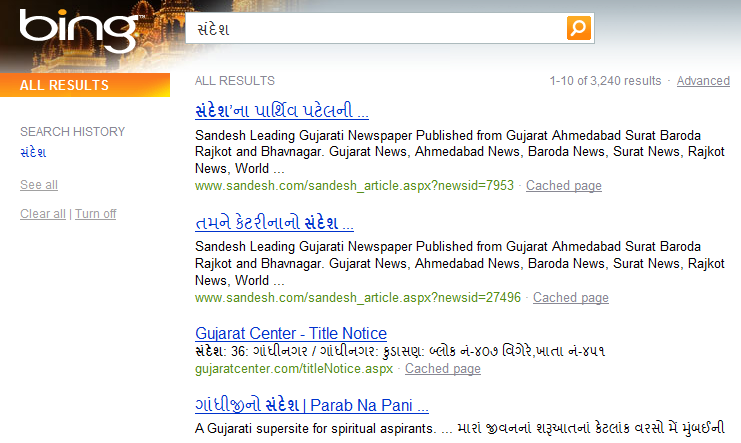 We can also search in Gujarati using any popular search Engine. Searching for "સંદેશ" in Google and Bing is shown below. Windows also allows us to change the whole interface of Windows with Gujarati menus, program titles, dialog boxes, etc., with a Language Interface Pack (LIP). It is a little awkward to see everything in Gujarati, especially since not everything translates well; however, it can be done. Windows XP requires the installation of Windows XP LIP to be installed. Once installed, all of your built-in menus, control panel items, included program titles, dialog boxes, popups, etc. will be in Gujarati. Windows Vista users can download the LIP from here: Vista LIP. Windows 7 LIP is probably in beta as of current. After the comparison, we see how versatile Unicode fonts can be. And now, we progress to our Unicode discussion.